Ideal for dimly lit entrance/exits, this 50W LED floodlight contains a 3hr back-up battery to ensure that it continues to light your escape in the event of an emergency. Supplied complete with a separate PIR sensor, the 50W floodlight will activate upon detecting movement and continues to function for 3hrs during a power cut. The die cast aluminium casing and toughened glass lens help to give this floodlight an IP65 rating, making it ideal for outdoor installation. Please note: The PIR sensor is supplied separately and should be fitted by a qualified electrician. PIR sensors work by detecting moving sources of heat in comparison to the ambient "background" infrared radiation, for example people or cars going past. The sensor needs to be angled correctly during installation, taking into account any obstacles which may block its "line of sight" as well as any potential sources of rapid change in heat that may trigger false activation. To help prevent false activations this PIR sensor comes with a special material that can be used to cover parts of the sensor, as described in the manual. 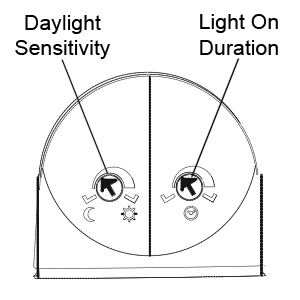 In order to suit any use case the sensor also has two variable dials which can be used to alter the "dusk to dawn" daylight sensitivity and light duration, as per the below diagram. The left-hand dial controls the daylight sensitivity of the sensor, referred to as "Dusk Level" in the manual. When turned fully clockwise, to the Sun symbol, the sensor will detect motion and activate during the day while turning it fully anti-clockwise, to the moon symbol, means it will only work during the night. The right-hand dial controls the activation time of the connected floodlight, referred to as "Delay Time" in the manual, and varies from 5 seconds (anti-clockwise) to 15 minutes (clockwise). For example, to turn the floodlight on for 15 minutes when motion is detected after dusk, the right-hand dial should be fully clockwise while the left-hand dial should be approximately a 1⁄4 turn away from the moon symbol. This is the technical data for the Emergency LED Floodlight with PIR Motion Activation.